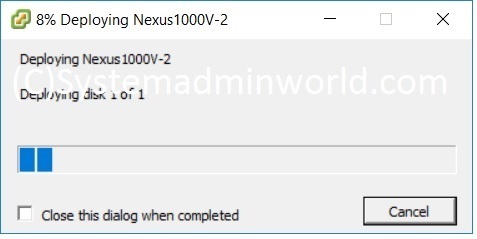 IP address for your new Nexus 1000V DS. 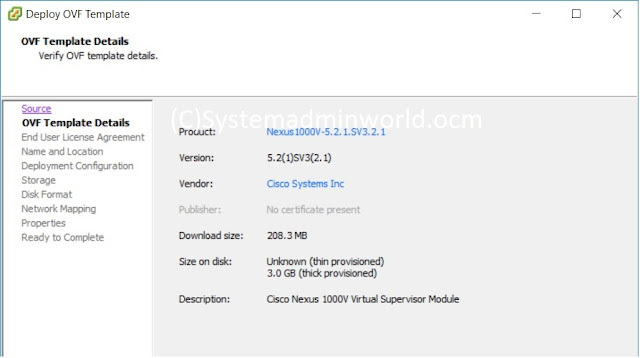 It will install on VCenter Server and VMware Update Manager (VUM) versions. If you are using the OVA file for installation, make sure that the CPU speed is 2048 MHz or greater. If the CPU speed is less than 2048 MHz, then use ISO image for installation. HA Role should already have identified for this VSM from the list in the following table. Ensure that the script is executable. 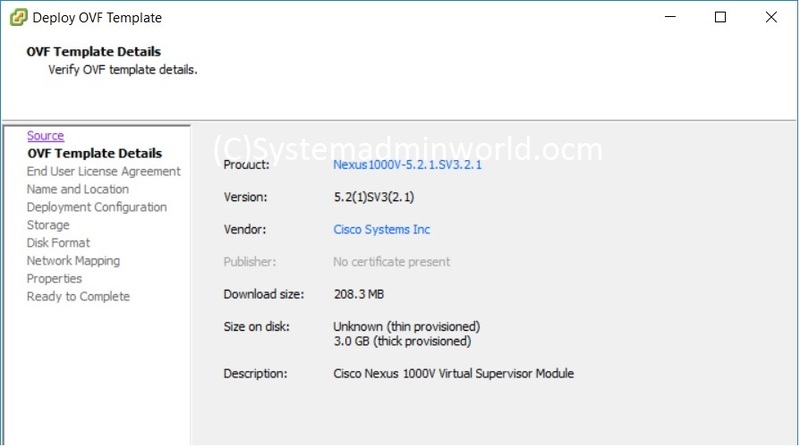 "Authenticity of Cisco-signed image Nexus1000v.5.2.1.SV3.1.1.zip has been successfully verified"
Select OVA File from downloaded directory. Verify the OVA image info and click next. Provide IP and subnet information. Verify all the configuration parameters and click on finish. Using your VMware documentation, attach the VSM ISO image to the virtual CD-ROM and copy the software to a virtual machine (VM). 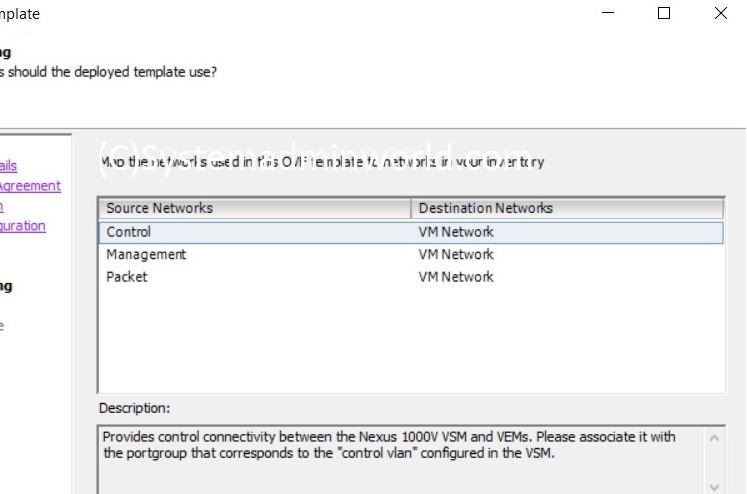 Make sure that the VSM VM is powered off. In the vSphere client Virtual Machine Properties window Hardware tab, choose Memory. In the Memory Size field, choose 4 GB. In the Resources tab, choose Memory. In the Reservation field, choose 4096 MB. In the Resources tab, choose CPU. In the Reservation field, choose 2048 MHz. The VSM VM memory and CPU speed settings are saved in VMware vSphere Client. 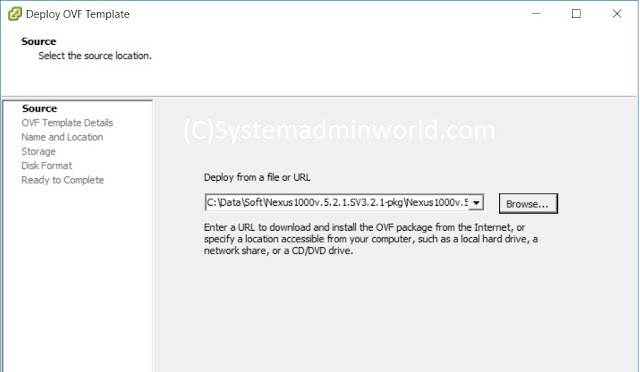 Right-click the VSM and choose Open Console. This in turn submit usually redeem much website. How you would market it? The item provides fine specialized perspective attached to situations. Just maybe providing whatever actual alternatively good to offer home elevators is the central factor.